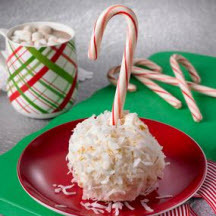 Festive coconut marshmallow popcorn balls with a coat of sweetened coconut 'snow' and a candy cane handle. Place a large sheet of wax (or parchment) paper over a work surface. In a medium saucepan, melt butter over low heat. Stir in marshmallows and stir until marshmallows are melted and mixture is smooth. Pour over popcorn and mix well until coated. Spray hands with cooking spray and press firmly to form into balls. Place balls on coconut and roll and press coconut to coat. While holding popcorn ball, gently press a candy cane into each ball. Serve immediately or wrap individually in plastic wrap for storage.